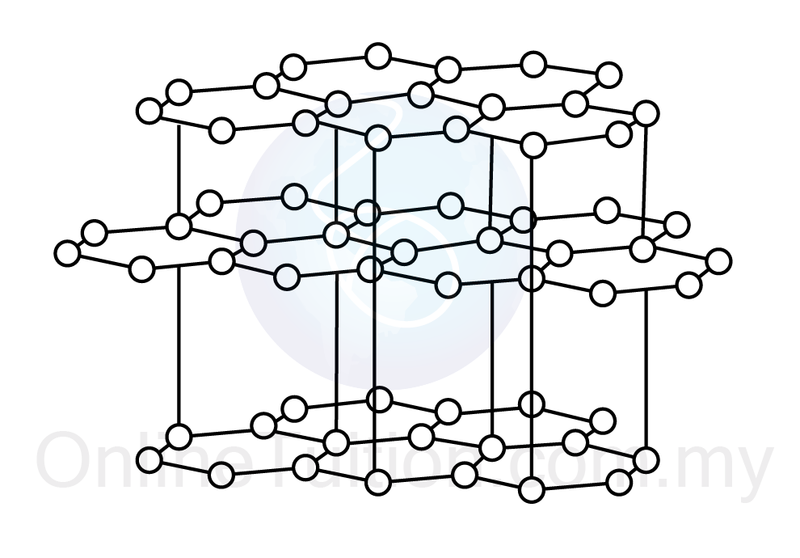 In an ionic compound, the alternate positive and negative ions in an ionic solid are arranged in an orderly way as shown in the image to the right. 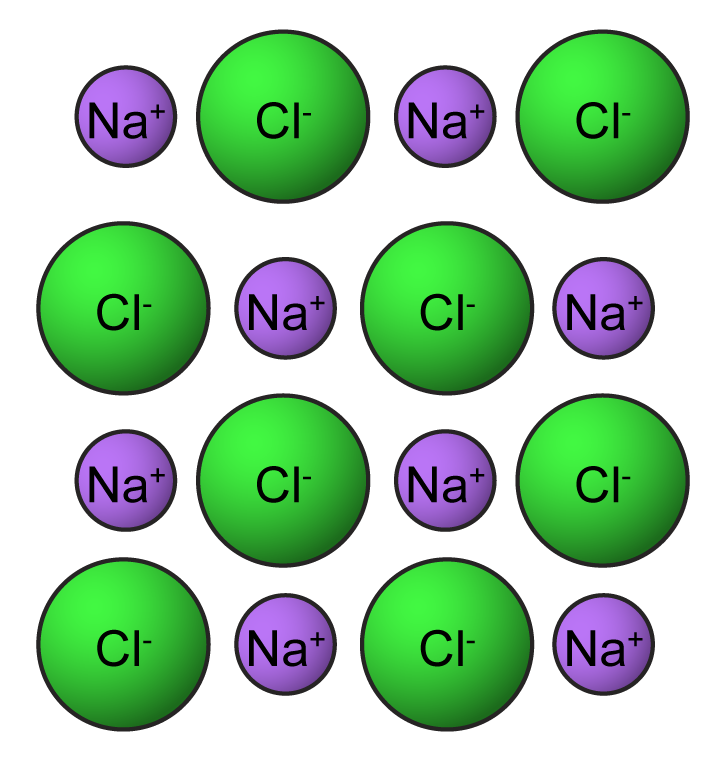 The ions can form a giant ionic lattice structure with ionic bond between the ions. 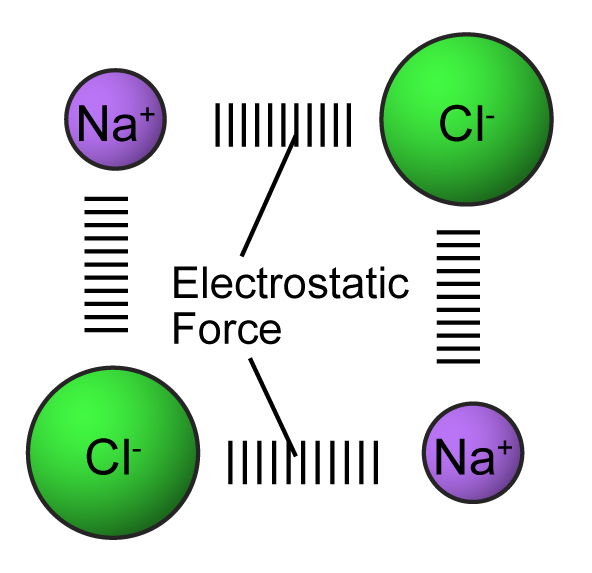 The ionic bond is the strong electrical attraction (electrostatic force) between the positive and negative ions next to each other in the lattice. The strong bonding force makes ionic compounds has high melting and boiling points. All ionic compounds are crystalline solids at room temperature. They are hard but brittle, when stressed the bonds are broken along planes of ions which shear away. Many, ionic compounds (but not all) are soluble in water. The solid crystals DO NOT conduct electricity because the ions are not free to move to carry an electric current. However, if the ionic compound is melted or dissolved in water, the liquid will now conduct electricity, as the ion particles are now free. Most covalent compounds are made up of independent molecular units, as shown in figure above. The attraction force between molecules is the weak Van der Waals’ force. Properties of Simple Covalent Molecular Substances – Small Molecules! 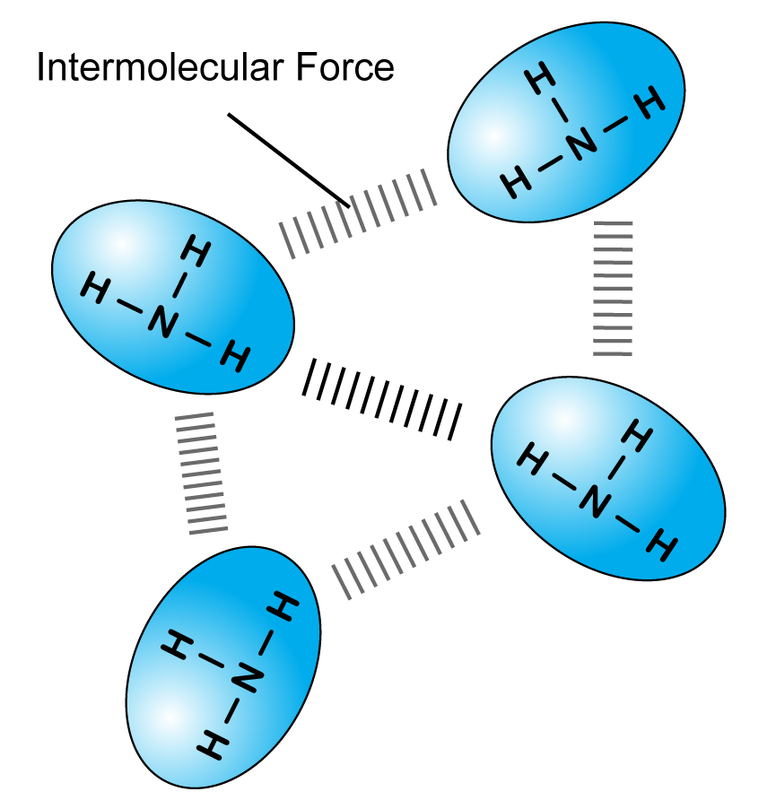 The intermolecular force between the simple covalent molecules is very weak. 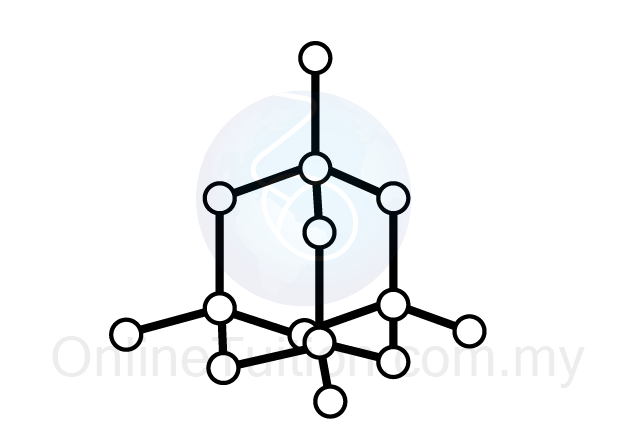 Therefore, covalent compounds have low melting and boiling point. They are also poor conductors of electricity because there are no free electrons or ions in any state to carry electric charge. Most small molecules will dissolve in a solvent to form a solution. The macromolecular compounds have giant, covalent molecules with extremely large molecular lattices. They have very high melting and boiling points. They don’t conduct electricity — not even when molten (except for graphite). They’re usually insoluble in water. Examples of such macromolecules are diamond, silica and graphite. A diamond crystal or a grain of sand is just one giant molecule. Such molecules, because they are so rigid and strong, have very high melting points. Each carbon atom forms four covalent bonds in a very rigid giant covalent structure, which makes diamond the hardest natural substance. This makes diamonds ideal as cutting tools. All those strong covalent bonds give diamond a very high melting point. It doesn’t conduct electricity because it has no free electrons. Carbon also occurs in the form of graphite. 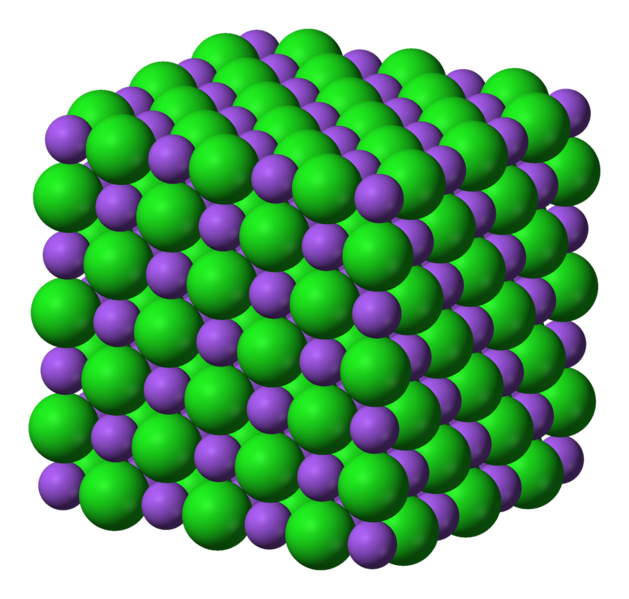 The carbon atoms form joined hexagonal rings forming layers 1 atom thick. Graphite is black and opaque. Each carbon atom only forms three covalent bonds, creating sheets of carbon atoms which are free to slide over each other. This makes graphite slippery, so it’s useful as a lubricant. The layers are held together so loosely that they can be rubbed off onto paper to leave a black mark — that’s how pencils work. Graphite has a high melting point — the covalent bonds need lots of energy before they break. Only three out of each carbon’s four outer electrons are used in bonds, so there are lots of spare electrons. This means graphite conducts electricity — it’s used for electrodes.